Want some inspiring summer reading? Last week I sat down on the dock planning to thumb through this book, but found myself plowing right through and really enjoying it! 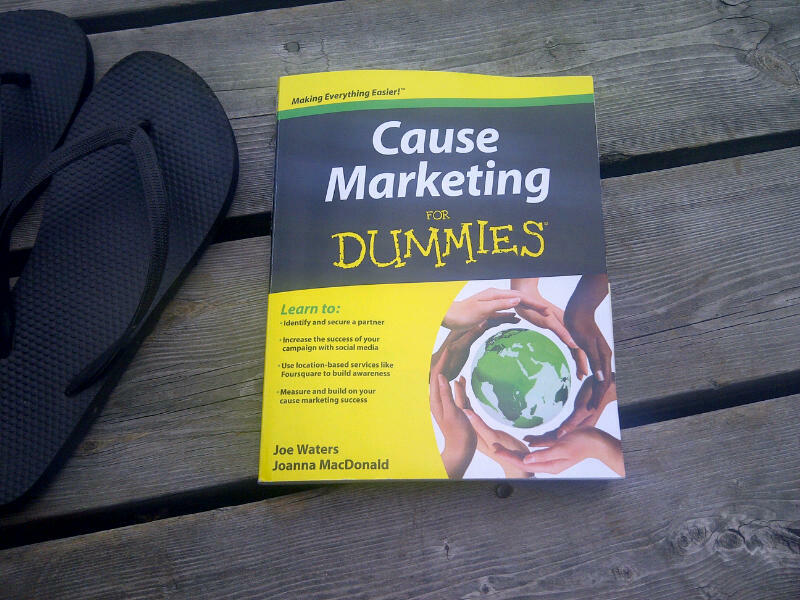 And I don’t usually think of myself as a “dummie,” but I have to admit that Joe Waters and Joanna MacDonald’s new book - Cause Marketing for Dummies - sure set me straight about what cause marketing is and isn’t. If you thought you knew what it was and how to do it, you might want to think again...and read this great new book. Why should non-profits consider cause marketing? Has your organization ventured into the cause marketing arena yet? This book is a cause marketing primer that would be an excellent starting point for organizations that haven’t yet investigated “partnerships between companies and causes.” Joe Waters and Joanna MacDonald wrote this book “to share what [they] had learned developing successful cause marketing programs and to bring small companies and nonprofits together for win-win partnerships.” While I read it with our Wild Apricot users and blog readers in mind - small non-profits and membership-based organizations - I think its message would resonate with organizations large or small. A new source of revenue from companies. While the community relations arm of a company awards grants, and senior management are prospects for individual gifts, cause marketing taps the marketing muscle of the company and opens a new door in the corporate suite. Increased awareness: Cause marketing gives causes a voice, a presence, in an increasingly crowded and competitive world. It reaches new donors. Many causes want to target a new, younger generation. …The cone study confirms Millennials are enthusiastic about cause marketing and their brand decisions are influenced by social/environmental causes. Leverage what you’ve got: “Every cause has assets that can be useful to their cause marketing program. …Recognizing assets requires savvy and smarts: the savvy to see them and the smarts to use them. Use your events to land new partners. Most causes host large, well-attended and successful events that can be easily leveraged to recruit cause marketing partners. Highly motivated consumers and employees can make a big difference in the success of your cause marketing program. Employees that are motivated to support the cause are more enthusiastic fundraisers. Employees that are better trained… can better communicate the program to consumers. Incentives can boost employee motivation when used sparingly and strategically. It’s about selling! Selling is the thing that will turn your cause marketing idea into a promotion with a real cause or business. Finding the right partner: if you already have a partner, cause marketing is a “no-brainer” and it can also deepen the bonds you have with existing corporate donors. When targeting businesses, look for the intersection of location and experience with the mission. … Companies that are geographically connected to your nonprofit’s mission are the easiest targets. This is only a glimpse at the information, insight and examples that this book has to offer! a special invitation to an October webinar: 10 More Cause Marketing Tricks, Tools & Tactics. You get all these for FREE when you buy the book and send your receipt to book@selfishgiving.com. Has your organization tried cause marketing? Share any tips or ideas you have in the comments section below.